Beautiful modern property! The art here was mind blowing, only thing missing is a pool. Loved the hotel, very clean and friendly staff. Room was nice and spacious. Close the many restaurants and bars. About 10 minute walk to the French Quater. The hotel is located centrally in the hip downtown warehouse district, walking distance to Bourbon Street and Garden District. Since this is technically a 4 star hotel, we expect to have umbrellas available but they didn't. We had to find a place to buy an umbrella when the rain came. In New Orleans, where weather is unpredictable, I'd think they'd have that available to us. This hotel is beautiful! Staff was so friendly and welcoming. Surrounded by so many places to eat and right in the middle of the business district. The only bad thing was that the halls smelled and parking was $40 a night. Next time I won’t be parking there I will look for a Groupon. Other than that we loved it! I seriously love the entire place. Best hotel I’ve ever stayed in! It’s a nice hotel. Our room wasn’t ready at 3 but we walked around and our room was ready an hour later. It’s a nice size room and very clean. Need a Pool and Business Center to make this hotel Great! We had our "bucket list" for where we wanted to visit and restaurants to eat. We actually walked to Bourbon Street in The French Quarter. On our way back to the hotel there are shops along the way to duck into and buy stuff. Our first night there we learned that one of the restaurants on our list was only three blocks away so we walked there. After eating, we walked to Harrah's! We used Uber for other adventures and they were always 2-3 minutes away. The Staff was very hospitable in answering our questions. Checking on discounts for us to use on some of the sights. I just love this hotel!! The hotel had a friendly staff and is in a great location for someone going to the Convention Center. The hotel is very new and really clean. We had a great view. It is right next to some awesome restaurants like Merils snd Marcelos. That's all i have to say but Orbitz makes me keep writing which is a pain for me and for you. Cambria hotel was very clean and the staff was excellent. Not too far from Bourbon street but far enough to have the calm and quiet if you're wanting that. Cambria made my stay that much more pleasant and I would recommend it to anyone. Located in Central Business District, Cambria Hotel New Orleans Downtown Warehouse District is within a 5-minute walk of popular attractions such as Louisiana Children's Museum and The Outlet Collection at Riverwalk. This 162-room, 4-star hotel welcomes guests with conveniences like a restaurant, a bar/lounge, and a 24-hour health club. Enjoy a leisurely bite to eat at the onsite restaurant, or have a drink at the bar/lounge. For your convenience, a cooked-to-order breakfast is served for a fee on weekdays from 6:30 AM to 10:30 AM and on weekends from 7 AM to 11 AM. Guests can enjoy a flat-screen TV and stay connected with WiFi. Beds sport premium bedding and the bathroom offers a hair dryer and free toiletries. Other standard amenities include a refrigerator, a coffee maker, and a safe. 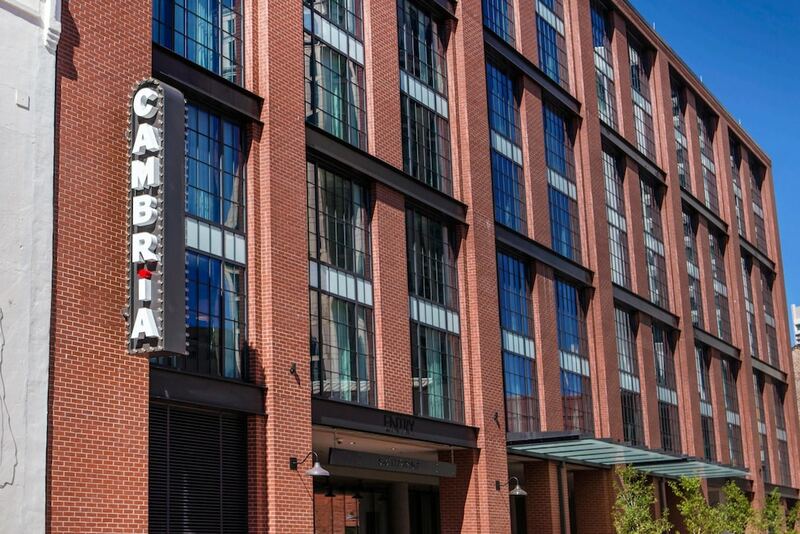 At Cambria Hotel New Orleans Downtown Warehouse District, guests have access to a 24-hour health club, WiFi in public areas, and conference space. Valet parking is available for USD 38.00 per day. The front desk has multilingual staff on hand 24/7 to help with concierge services, dry cleaning/laundry, and securing valuables. Additional amenities include laundry facilities, a TV in a common area, and a porter/bellhop. Cooked-to-order breakfast is served on weekdays from 6:30 AM to 10:30 AM and on weekends from 7 AM to 11 AM for a fee. Recreation features at Cambria Hotel New Orleans Downtown Warehouse District include a 24-hour health club. The preferred airport is New Orleans, LA (MSY-Louis Armstrong New Orleans Intl. ): 22-min drive, 15.8 mi/25.5 km.